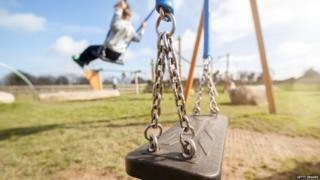 Ministers do not know how many hundreds of thousands of children in England are living risky or vulnerable lives, says children's commissioner Anne Longfield. England's children's champion has tried to calculate the total in a report, in the absence of overall official data. She found some 670,000 children live in high risk family situations, thousands with parents in addiction treatment. Children's minister Robert Goodwill said support for vulnerable children was being given across government. But he acknowledged there was more to do. Ms Longfield highlighted that half a million children are so vulnerable that the state has to step in with support, and 46,000 are thought to be in gangs. Some 200,000 are judged by the local council to have experienced trauma or abuse and 119,000 children are homeless or living in insecure or unstable accommodation. Despite widespread concern, the most recent estimate of children suffering from mental health conditions - around 800,000 - is 13 years out of date. The children's commissioner is clear that despite its researchers' best efforts, the figures it has to draw from may contain lots of overlaps and double counting. It is the start of a longer piece of work to clarify the scale and nature of child vulnerability and to encourage the government to collect better data and define what counts as vulnerability. She is also clear that there will be many "invisible" children living in vulnerable situations who have not been reported to services and also because of gaps in data. Ms Longfield says: "This report should be a wake-up call to the government and policy-makers, who have been in the dark about the level of child vulnerability for too long. "It is shocking that half a million children need direct intervention or care from the state because they are living vulnerable lives. "On top of that there are many hundreds of thousands of other children growing up in potentially high risk situations. "Yet even more shocking is that this is only the tip of the iceberg. "The actual numbers are likely to be much higher. The truth is nobody knows the exact number of vulnerable children." The report highlights the fact that there are many different indicators used in varied ways by government departments, agencies and others, causing confusion about the scale of the problems among children. She adds that behind the confusion are unidentified and invisible children, suffering a variety of risks and vulnerabilities. "We can trace in minute detail the academic progress of a child from four to 18 and beyond, but when it comes to describing and assessing the scale of negative factors in a child's life which will hamper their progress, we are floundering," Ms Longfield says. Mr Goodwill said that every single child should have their voice heard and receive the care and support that they need to realise their potential. "Across government, we are taking action to address this issue - whether through reforming children's social care, prioritising mental health, or better protecting victims of domestic violence and abuse. "For some of the most vulnerable, our new What Works Centre for children's social care will ensure social workers across the country are able to learn from best practice in keeping children safe. "We recognise the scale of this challenge - and, while the number of children in need has remained relatively stable since 2010, there is always more to do. "We will look carefully at these exploratory statistics and I am looking forward to working with the children's commissioner as this important work continues."